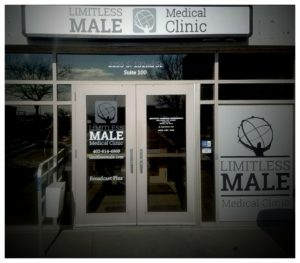 Our client, Limitless Male Medical Clinic, is hosting an Open House at their new location near 132nd & Center St. The event will mark the official opening of the men’s health clinic in Omaha, and we were happy to play a role in getting their new clinic ready for patients. Quality Glass & Mirror fabricated and installed two custom glass interior doors with sidelites for the clinic. The glass for the doors to the conference room is 3/8” clear tempered glass with brushed stainless hardware. If you visit the clinic or attend the Open House, be sure to note our custom glass work!